This example shows how to use Robust Control Toolbox™ to analyze and quantify the robustness of feedback control systems. It also provides insight into the connection with mu analysis and the mussv function. Figure 1 shows the block diagram of a closed-loop system. 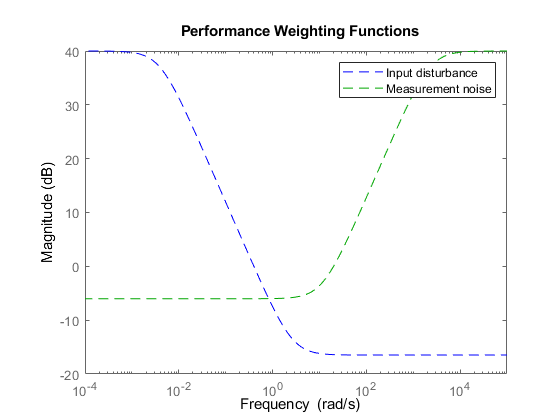 The plant model P is uncertain and the plant output y must be regulated to remain small in the presence of disturbances d and measurement noise n.
where Wd and Wn are weighting functions reflecting the frequency content of d and n. Here Wd is large at low frequencies and Wn is large at high frequencies. We use the controller designed in the example "Improving Stability While Preserving Open-Loop Characteristics". The plant model used there happens to be the nominal value of the uncertain plant model created above. For completeness, we repeat the commands used to generate the controller. The variable ClosedLoop is an uncertain system with two inputs and one output. It depends on two uncertain elements: a real parameter k and an uncertain linear, time-invariant dynamic element delta. 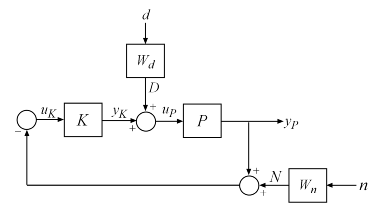 Uncertain continuous-time state-space model with 1 outputs, 2 inputs, 10 states. Type "ClosedLoop.NominalValue" to see the nominal value, "get(ClosedLoop)" to see all properties, and "ClosedLoop.Uncertainty" to interact with the uncertain elements. The classical margins from allmargin indicate good stability robustness to unstructured gain/phase variations within the loop. Does the closed-loop system remain stable for all values of k, delta in the ranges specified above? Answering this question requires a more sophisticated analysis using the robstab function. 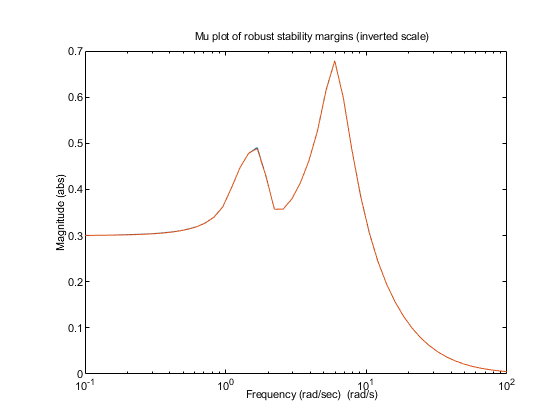 The variable stabmarg gives upper and lower bounds on the robust stability margin, a measure of how much uncertainty on k, delta the feedback loop can tolerate before becoming unstable. For example, a margin of 0.8 indicates that as little as 80% of the specified uncertainty level can lead to instability. Here the margin is about 1.5, which means that the closed loop will remain stable for up to 150% of the specified uncertainty. The variable wcu contains the combination of k and delta closest to their nominal values that causes instability. We can substitute these values into ClosedLoop and verify that these values cause the closed-loop system to be unstable. The structured singular value, or μ, is the mathematical tool used by robstab to compute the robust stability margin. If you are comfortable with structured singular value analysis, you can use the mussv function directly to compute mu as a function of frequency and reproduce the results above. The function mussv is the underlying engine for all robustness analysis commands. In its simplest form, mu-analysis is performed on a finite grid of frequencies. Pick a vector of logarithmically-spaced frequency points and evaluate the frequency response of M11 over this frequency grid. Compare SMfromMU to the bounds stabmarg computed with robstab. The values are in rough agreement with robstab yielding slightly weaker margins. This is because robstab uses a more sophisticated approach than frequency gridding and can accurately compute the peak value of mu across frequency. This says that the controller K meets the disturbance rejection and noise insensitivity goals. But is this nominal performance maintained in the face of the modeled uncertainty? This question is best answered with robgain. The performance level 1 is not robust to the modeled uncertainty. -- The gain remains below 1 for up to 39.9% of the modeled uncertainty. -- There is a bad perturbation amounting to 40% of the modeled uncertainty. -- This perturbation causes a gain of 1 at the frequency 0.131 rad/seconds. The answer is negative: robgain found a perturbation amounting to only 40% of the specified uncertainty that drives the closed-loop gain to 1. The worst-case gain is about 1.6. This analysis shows that while the controller K meets the disturbance rejection and noise insensitivity goals for the nominal plant, it is unable to maintain this level of performance for the specified level of plant uncertainty.